The Malik Fraternity Inc. College Fair May 9th! Interested in going to college? It’s never too late! 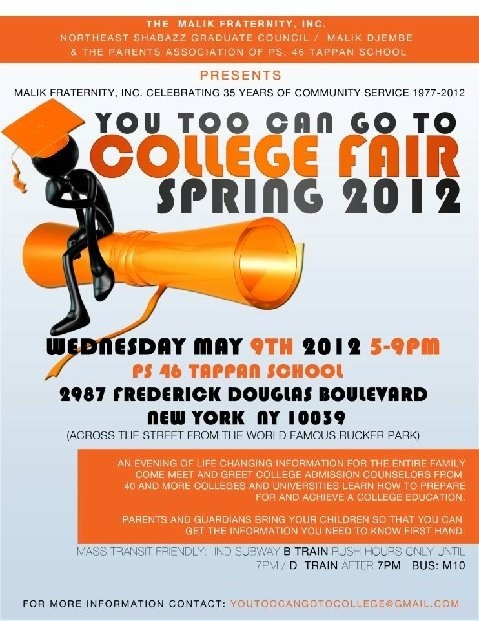 The Malik Fraternity Inc. presents the You Too Can Go to College Fair Spring 2012 on May 9th, 2012 from 5PM-9PM! Take a look at the flyer below for details! If you are a student looking for scholarships, these may be of use to you. Some of the scholarships apply to African-American students, as well as other minorities. Take a look and see if you are eligible for scholarship funding! The School Pride Scholarship is available to high school seniors and full-time undergraduate students. To be considered, you must submit an essay explaining what your school has to offer that you can’t find anywhere else. You must have a minimum 2.5 GPA to be eligible for this award. Essays must be posted on a blog. NMIC YAIP accepts applicants from all parts of Manhattan and the Bronx, but we give priority to applicants who live in the Washington Heights/Inwood, West Harlem, Manhattanville, Morningside Heights, & Hamilton Heights. Each YAIP program in each borough gives priority to those who live in their community districts. 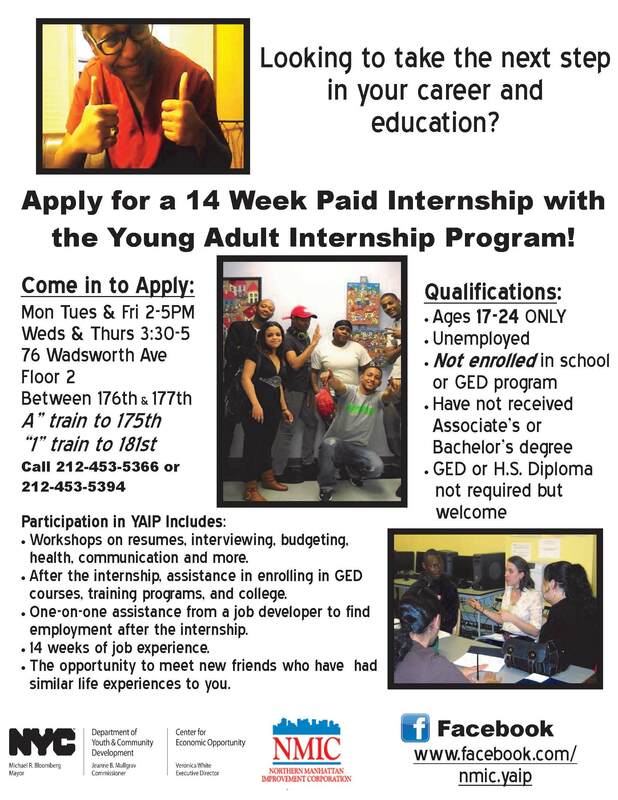 Go to the NMIC Washington Heights office at 76 Wadsworth Avenue (2nd floor) to apply in person. Applicants are welcomed to call and schedule an appointment. – Bring proof of identity (photo ID card), proof of address (bank statement, utility bill from household, state ID issued in the last 6 months, or letter from a shelter or transitional housing program, an original birth certificate, and an original social security card. If an applicant is accepted, they will enroll in the program and begin with a two week paid orientation at the NMIC office including classes on job readiness, financial literacy, soft skills, healthy living, computer literacy, conflict resolution, and leadership development. After orientation, youth will complete a 12 week paid internship and will be paid at a rate of $7.25 an hour for 25 hours a week, and will receive weekly educational classes to further their career and academic skills. All youth will receive one-on-one support from a NMIC academic counselor, job developer, and program manager. NMIC’s nine month post-internship follow up and retention phase will include career and academic counseling and facilitate enrollment in educational programs and job placement. Please feel free to contact the NMIC YAIP office at 212-453-5366 (Lily Smith) or 212-453-5394 (Rohan Pessoa) with any further questions or interest in holding a YAIP outreach event at your agency. For those focusing on medical school, mark your calendars for Kaplan’s Medical School Insider scheduled for broadcast on Monday, May 7th 8 pm ET / 5 pm PT. Get all of your medical school admissions questions answered! You’ll learn about the top admissions factors, how to craft a winning personal statement, tips and tricks to use for the MCAT®, and how the admissions process looks from the inside. New York Academy of Medicine is HIRING! Please email a resume and cover letter to hr@nyam.org. Please include “Policy Associate” in subject line. For more information, visit the website: http://www.nyam.org. AFRICAN-AMERICAN STUDENTS ARE NOT APPLYING FOR SCHOLARSHIPS! There are a number of companies and organizations who have donated money for scholarships to African Americans, but a great deal of the money is being returned because of a lack of interest or awareness. Check out this list of opportunities!